Did you know that the average British person consumes around 7,000 calories on Christmas Day? I guess all the calories from those drinks, sweets and chocolates we nibble on throughout the day add up – not to mention the calories from all the meat and side dishes that we pile on our plates at lunchtime! 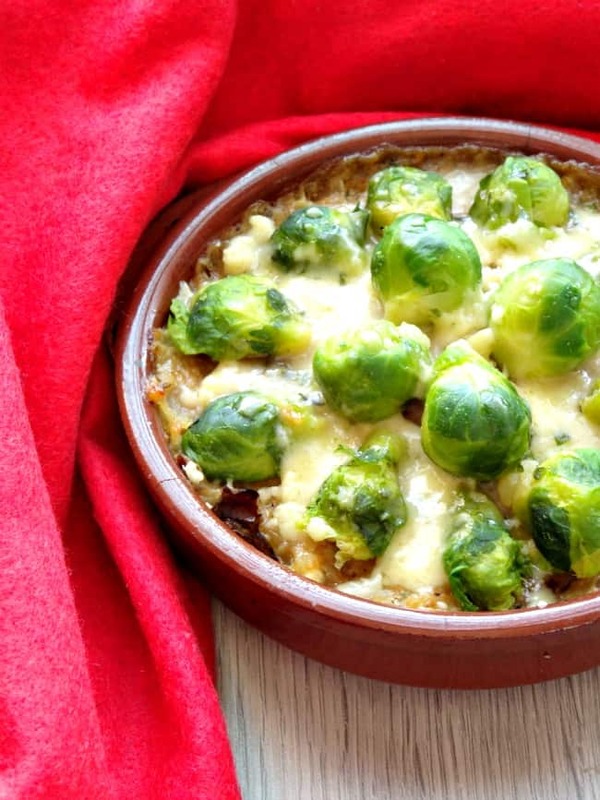 I’m a big believer in turning traditional comfort food dishes we all love into lighter, healthier dishes which taste just as good – this is where this brussels sprouts gratin recipe comes in! 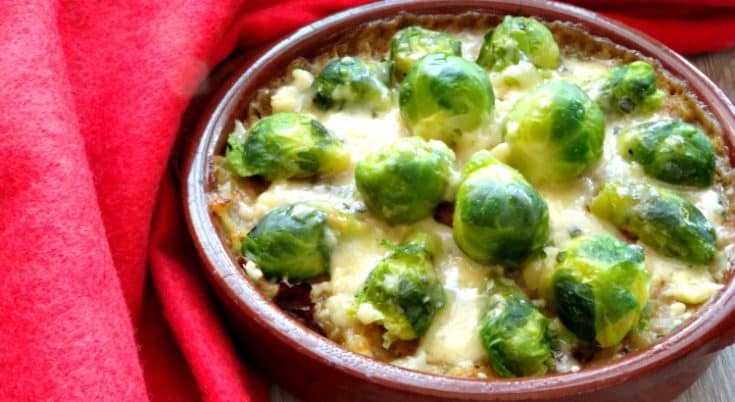 It’s still packed with loads of ooey-gooey melted cheddar which not only tastes amazing but provides a drool-worthy texture for a fraction of the calories that a tray of full-fat brussels sprouts gratin has. As long as you use a strong cheese (I opted for a cheddar, but any strong hard cheese will work) you can get away with only using a small amount without compromising one single bit on the flavour. 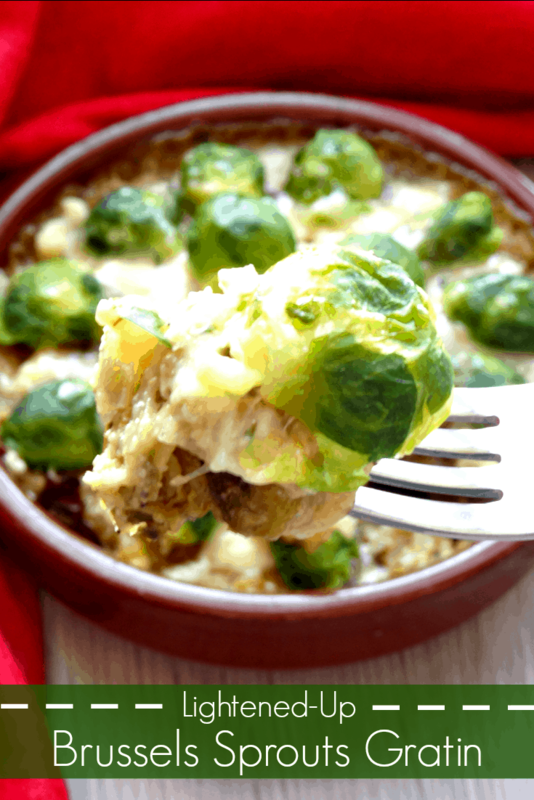 One of my favourite things about this lightened-up brussels sprouts au gratin is that it tastes so good that even people who claim to hate brussels sprouts love it! I always use button brussels sprouts when I’m cooking for people who aren’t keen on the bite-size vegetable because the flavour isn’t as over-powering as the full-size counterparts. And since these brussels sprouts are cooked three times in three separate ways, the usually-strong flavours are also softened up a bit and the uhh…unpleasant side-effects are toned down because the enzymes which our bodies struggle to break down on their own are better broken down the longer you cook the sprouts. Preheat the oven to 400F/200C and coat a small baking tray with olive oil. Cook the frozen brussels sprouts in the microwave on full power for 4 minutes. Turn the brussels sprouts out onto a chopping board and slice each one in half lengthways. Place the halved sprouts into the greased baking tray and add pour over the salt and olive oil. Shake the tray to ensure everything is well coated then bake in the oven for 15 minutes. After 15 minutes, remove the spouts from the oven, toss them about a bit and bake for a further 5 minutes. Melt the butter in a saucepan over a medium heat and add in the chopped onion. Cook for 10 minutes, stirring regularly, until the onion is soft and it starts to turn golden brown. Add in the flour, milk, thyme, onion powder, garlic powder and half of the cheddar cheese. Stir well to make sure all the ingredients are well combined. Cook the white sauce on a medium heat for 10 minutes, until thickened, then remove the tray of brussels sprouts from the oven and pour the sauce over them. Return the brussels sprouts to the oven and bake for a further 15 minutes, until the thick sauce has turned golden brown. Sprinkle over the rest of the grated cheese, top with an extra four brussels sprouts for decoration if you wish and serve. I love brussels sprouts too! Delish! Thank you so much for the feature, Joy! Glad to hear I’m not the only one who loves brussels sprouts 🙂 Hope you have a wonderful Christmas! 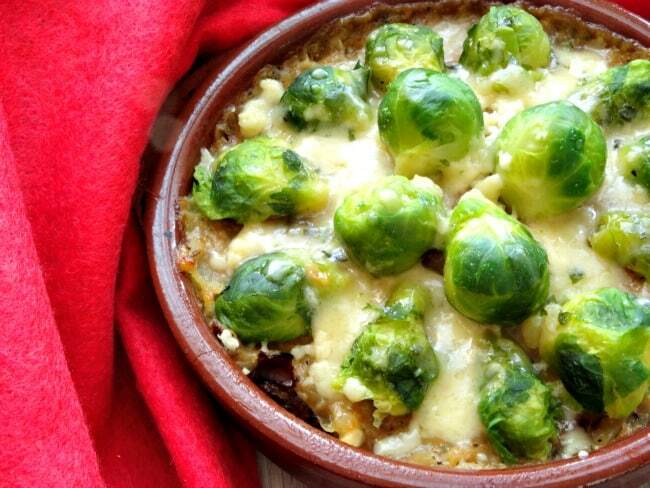 I just love this Gratin,it looks delicious. Thanks so much for sharing it with us at Full Plate Thursday.